I am sure that it started out innocently enough. The tabs on the little cups are probably perfect for ferret teeth to grip. The weight is probably a satisfying heft without being too heavy. The cups are small, portable, and easily hidden. And hide them he did. But then, a tooth may have accidentally slipped through the foil and released the contents and a new discovery was made. I am sure that he thought "Wow...a treasure and a treat." Since his first taste, he has been tenacious about getting more. 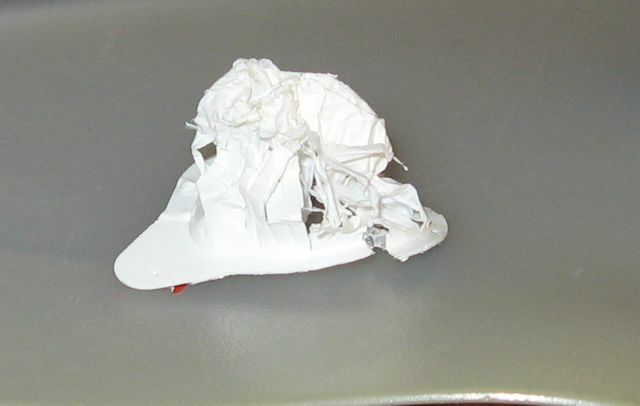 Here is a picture of a cup after the desperate creature had his "fix". Now please, don't feed your ferret creamer and don't send me lectures on the danger of ferrets chewing up items and getting them stuck in the digestive tract. WE KNOW, and believe me, we are doing everything we can to prevent our ferret from partaking. But honestly, this ferret can't give the stuff up. We have had to resort to not buying it. 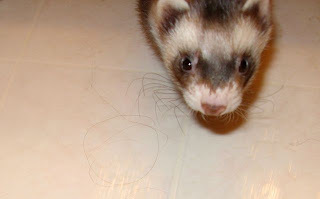 I am not sure which is worse--a ferret in "crack" withdrawal or a Hubster with no flavored cream for his coffee.